The total investment in real estate development in 2015 was 9,597.9 billion yuan, a nominal increase of 1.0 percent year-on-year (the real growth rate was 2.8 percent, after deducting price factors), 0.3 percentage points lower over the first eleven months. 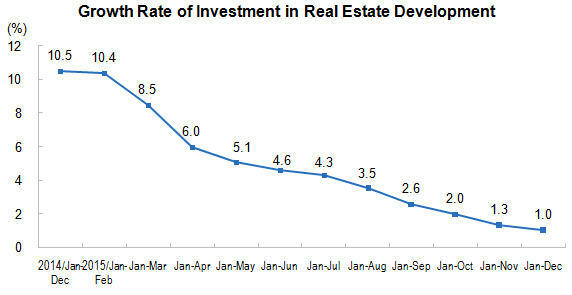 Of which, the investment in residential buildings was 6,459.5 billion yuan, up by 0.4 percent, 0.3 percentage points lower, and accounted for 67.3 percent of real estate development investment. In 2015, the real estate investment in eastern region stood at 4,967.3 billion yuan, up by 4.3 percent year-on-year, and the growth rate went down by 0.8 percentage points over the first eleven months; the central region stood at 1,912.2 billion yuan, went up by 4.4 percent, and down by 0.2 percentage points; western region stood at 2,170.9 billion yuan, up by 1.3 percent, and an increase of 0.2 percentage points; northeastern region stood at 547.5 billion yuan, down by 28.5 percent, and the pace of decline widened by 0.6 percentage points. In 2015, the floor space under construction by the real estate development enterprises accounted for 7,356.93 million square meters, up by 1.3 percent year-on-year, dropped 0.5 percentage points over the first eleven months. Of which, the floor space of residential building construction area was 5,115.70 million square meters, down by 0.7 percent. The floor space started this year was 1,544.54 millions square meters, down by 14.0 percent, and the pace of decline narrowed by 0.7 percentage points. Specifically, the floor space of residential buildings started in the year amounted to 1,066.51 million square meters, down by 14.6 percent. The floor space of buildings completed stood at 1,000.39 million square meters, went down by 6.9 percent, and the pace of decline widened by 3.4 percentage points. Of which, the floor space completed of residential buildings stood at 737.77 million square meters, went down by 8.8 percent. In 2015, the land area purchased by the real estate development enterprises totaled 228.11 million square meters, a year-on-year decrease of 31.7 percent, and the pace of decrease narrowed by 1.4 percentage points over the first eleven months. The total transaction of land reached 762.2 billion yuan, decreased 23.9 percent, and the pace of decrease narrowed by 2.1 percentage points. 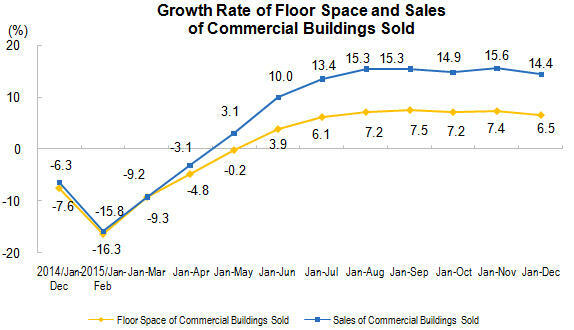 In 2015, the floor space of commercial buildings sold stood at 1,284.95 million square meters, a year-on-year increase of 6.5 percent, and down by 0.9 percentage points over the first eleven months. Of the total, the floor space of residential buildings increased 6.9 percent, office building increased 16.2 percent, and buildings for business use increased 1.9 percent. The sales of commercial buildings amounted to 8,728.1 billion yuan, an increase of 14.4 percent, down by 1.2 percentage points. Specifically, the sales of residential buildings went up by 16.6 percent, office buildings up by 26.9 percent, buildings for commercial business down by 0.7 percent. In 2015, the sale of floor space of commercial buildings in eastern region amounted to 555.09 million square meters, a year-on-year increase of 13.3 percent, down by 1.6 percentage points over the first eleven months. The amount of sales stood at 4,988.8 billion yuan, went up by 23.1 percent, a decrease of 2.0 percentage points. The sale of floor space of commercial buildings in central region amounted to 324.09 million square meters, increased 8.9 percent, a decrease of 1.4 percentage points. The amount of sales stood at 1,635.5 billion yuan, increased 12.5 percent, a decrease of 1.1 percentage points. The sale of floor space of commercial buildings in western region amounted to 331.73 million square meters, an increase of 3.4 percent, a decrease of 0.4 percentage points. The amount of sales stood at 1,693.9 billion yuan, went up by 5.0 percent, and a decrease of 0.5 percentage points. The sale of floor space of commercial buildings in northeastern region amounted to 74.05 million square meters, a decrease of 24.5 percent, and the pace of decline widened by 0.2 percentage points. The amount of sales stood at 409.9 billion yuan, went down by 19.8 percent, and the pace of decline was consistent with the first eleven months. At the end of 2015, the floor space of commercial housing for sale reached 718.53 million square meters, increased 22.17 million square meters compared with that at the end of November. Of which, the residential buildings for sale increased 11.55 million square meters, office buildings increased 1.28 million square meters, buildings for business use increased 4.58 million square meters. In 2015, the sources of funds for real estate development enterprises reached 12,520.3 billion yuan, up by 2.6 percent year-on-year, and an increase of 0.4 percentage points over the first eleven months. Specifically, the domestic loans stood at 2,021.4 billion yuan, decreased 4.8 percent, foreign investment stood at 29.7 billion yuan, down by 53.6 percent, self-raising funds stood at 4,903.8 billion yuan, down by 2.7 percent, and other sources stood at 5,565.5 billion yuan, up by 12.0 percent. Among the other sources of funds, deposits and advance payments totaled 3,252.0 billion yuan, increased 7.5 percent, personal mortgage loans totaled 1,666.2 billion yuan, up by 21.9 percent. In December, the national real estate climate index was 93.34, decreased 0.01 points month-on-month. The total investment in real estate development this year: refers to the investment of all construction projects for housing, land development projects, public welfare construction and land acquisition costs in the reporting period. The index is cumulatively statistical data based on the principle of image progress. Area of commercial buildings sold: refer total areas sold of new commercial buildings in the contract during the reporting period (i.e. area of floor space designated in the formal contract signed by both sides). The indicator is cumulative data. Value of commercial buildings sold: refers to the total contracted vale of new commercial buildings for sale during the reporting period (i.e. the total value of sales for selling of commercial building as designated in the formal contract signed by both sides). This indicator is cumulative data, as well as the sale of floor space of commercial buildings. Floor space of commercial housing for sale: refers to the floor space of commercial housing having not been sold or rented, among the floor space of commercial housing for sale or for rent finished at the end of report period. The floor space of housing completed in previous years and in current period is included, while the floor space of housing not for sale or for rent, such as housing removal and compensation, unified construction and agent-construction, public buildings, housing for own use of real estate companies, relocation housing, is not included. The sources of funds for real estate development enterprises in the year: refers to various currencies and sources of real estate development funds actually available by the real estate development enterprises in the reporting period. Specifically, it includes domestic loans, foreign investment, self-raised funds and other funds. The index is cumulative data. Floor space of buildings under construction: refers to the total floor space of all buildings by the real estate development enterprises during the reference time. Including floor space newly started in current year, floor space of continued construction of the building from the former period, floor space of stopped or postponed in the previous period but recovered in current year, floor space completed during current year, and newly started floor space in current year but postponed. Floor space under construction of multi-storey buildings refers to the total floor space of all stories. Floor space of houses newly started: refers to floor space of houses newly started by the real estate development enterprises during the reference time, the unit project as the accounting object. Not including continued construction area of housing which started in the previous period, and restarted construction area in the current year but stopped or postponed in the previous period. Specific due date is subject to starts to housing officially began ground-breaking gouge (ground treatment or permanent piles). Floor space of houses newly started refers to the entire floor spaces of whole building; the calculation can not be separated. Floor space of buildings completed: refers to housing construction during the reporting period have been completed in accordance with design requirements, achieved to living and conditions of use, acceptance of accreditation standards or to the final acceptance, total building areas could formally handed over to be used. Land acquisition area: refers to land area by the real estate development enterprises in the year through various ways to obtain land. Value of land transactions: refers to final amount of transactions of land use rights by the real estate development enterprises. In the primary land market, refers to the final section of land allocation, "auction" price and sale price; the secondary land market, refers to the finalize the contract price on land transfer, lease, mortgage, etc.. Price of land transactions and land acquisition area are the same scope, December calculate the average purchase price of land. All real estate development and corporate business units. Collected monthly with complete enumeration (no report in January). National real estate climate index fluctuations follow by the economic cycle theory, according to the business cycle theory and business cycle analysis, based on the use of time series, multivariate statistical, econometric analysis, use the real estate development and investment as the benchmarks, selected related indicators such as real estate investment, capital, area, sales, conducted by the seasonal factors and random factors, adopting the growth rate cycle method. National real estate index selected year 2000 as the base year, its growth rate set at 100. Typically, the most appropriate level of national real estate climate index is 100, the moderate level is between 95 and 105, the lower level is below 95, and the higher level is above 105. Eastern region includes Beijing, Tianjin, Hebei, Liaoning, Shanghai, Jiangsu, Zhejiang, Fujian, Shandong, Guangdong, and Hainan. Central region includes Shanxi, Anhui, Jiangxi, Henan, Hubei, and Hunan. Western region includes Inner Mongolia, Guangxi, Chongqing, Sichuan, Guizhou, Yunnan, Tibet, Shaanxi, Gansu, Qinghai, Ningxia, and Xinjiang. Northeastern region includes Liaoning, Jilin and Heilongjiang. 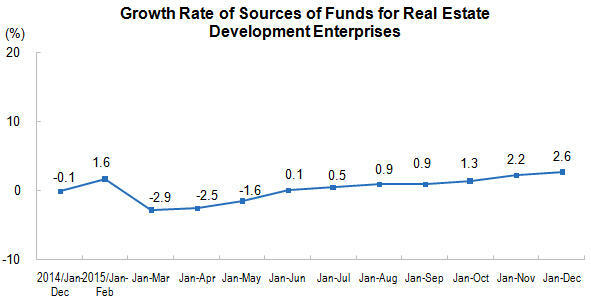 The growth rate of real estate investment is nominal growth rate, due to the investment in fixed assets price index was calculated on quarterly, in addition to the January-March, January-June January-September, and January-December was calculated on computable real growth rate, the other months only calculated the nominal growth rate.